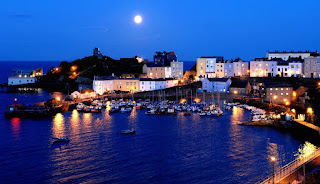 Visit Pembrokeshire and see what this great county has to offer. Situated along the Pembrokeshire Coastal Path, Barafundle Bay has been selected in the top 5 of the most beautiful beaches in the world. It is a 20 minute drive from the cottages. Skomer Island, a nature reserve for rare birds and the famous Puffins is a wonderful experience, and will leave you with some great memories and photographs. Pembrokeshire has a wealth of stunning castles and is also host to the smallest city in Britain. St David's is an hours drive from the cottages and is the birth place of the patron saint of Wales. St David's Cathedral is not to be missed. Most of our cottages have log burners to cosy up to after a busy day exploring. Accommodation with personal touches and carefully chosen furnishings all add up to a relaxing and reviving holiday, in St Florence near Tenby. Pembrokeshire is an exhilarating county and you'll take away many memorable experiences.